Birthday Frames is a free Windows 8 frames app is available under “photo” category of its App Store. This Windows 8 Birthday Frames app lets you add birthday frames on the existing or new photos on your Windows 8 PC. The birthday frames Windows 8 app provides you multiple photo frames from where you need to select and add colors to any existing or new photo. You can even rotate and resize the photo in order to fit perfectly into the chosen photo frame. Well, the story does not end up with only the birthday frames and some additional options. This Windows 8 birthday frames app also lets you add multiple photo effects which make your photo frame look even beautiful and attractive. But, I did not like the fact that the photo effects are for complete photo frame and not only for the photo. I would rather prefer the effects to be over the photo and not over the whole photo frame including the photo. Anyway.. using this Birthday Frames app for Windows 8, you can make your birthday photo look more beautiful than ever. You can easily save and share the photos directly on Facebook. It even allows you to pick photos from the existing photo albums you have on your Facebook account and put the beautiful birthday frames on it. Decorating your memorable moments with your kids have now become an easy task on your Windows 8 PC. 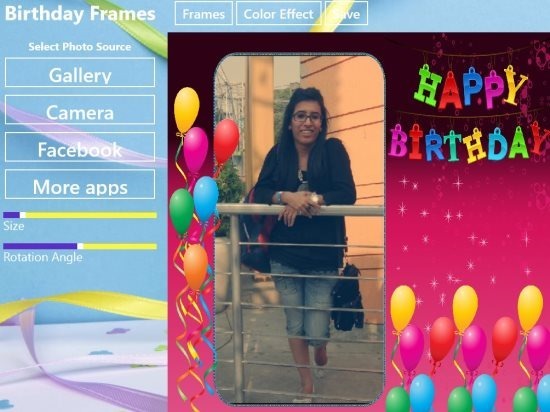 Lets have a look on some of the basic features of this Birthday Frames app. Put birthday frames on any photos. Save and post the photos to Facebook. Take photos from your PC camera and add frames. Adjust size and rotate photo angle. Also, check out our posts on Birthday Reminder Apps, and Encyclopedia Apps. In order to download Birthday Frames app in Windows 8, you need to open the given link in Internet Exlorer10 and proceed with further installation procedure. You will soon get the app in your Windows 8′ s Start Screen. In short, this Birthday Frames app for Windows 8 is a perfect tool to add colors to your birthday memories. I like the collection of frames and the rotating feature in the app.